A high-performance and properly-sized heating and cooling system is an important feature of high-performance homes. High-efficiency systems are engineered and installed to deliver more comfort, better moisture control, improved indoor air quality, and quieter operation. The heating and cooling systems in ENERGY STAR certified homes are fully engineered and tested, including sizing of equipment and ducts, sealing and testing ductwork, verifying proper refrigerant charge (for central air conditioners and heat pumps), and ensuring room-by-room air flow. This is all done in accordance with best practices established by the leading industry association and equipment manufacturers. 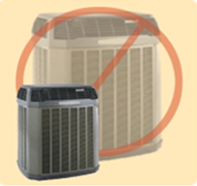 Benefits of Properly Sized HVAC Systems: Properly Sized Systems still require maintenance but last longer. This is especially important for your air conditioner (cooling) units, where a properly sized system works much more efficiently and helps to control humidity better. By combining an energy-efficient HVAC system with appropriate insulation, air sealing, and windows, you can reduce your energy bills, increase the durability of your HVAC equipment, and reduce the greenhouse gases in the air we breathe. The living space in high-performance homes has a constant source of fresh, filtered air to remove pollutants from your home. In your high-performance home, tight ducts ensure that your attic is not as cool as the rest of your house. Up to 30 percent of energy loss in a new home is attributed to a leaky duct system. ENERGY STAR certified homes are inspected and tested to ensure that joints in the duct system are sealed tightly so that conditioned air does not leak into storage spaces such as attics and garages or within the wall cavity. Ducts that are sealed tightly are less likely to pull apart letting conditioned air out or unconditioned air into the duct systems. This reduceds the potential for dust and pollen to infiltrate your indoor air. Benefits of Tight Ducts: Not only will Tight Ducts contribute to lower utility bills, but they will also improve the quality of air in your home and help maintain a uniform temperature throughout. Download an EPA fact sheet on efficient duct systems.